Since 2011, I have been curation and creating the most diverse and exciting permanent and monthly art exhibits in various Multnomah County Clinics, Human Solutions low-income building and newest Virginia Garcia Hospital with diverse pool of artists in my roster. In 2017, I was invited to be part of art curator for a year long monthly art exhibit at Multnomah Art Center, Portland, Oregon. 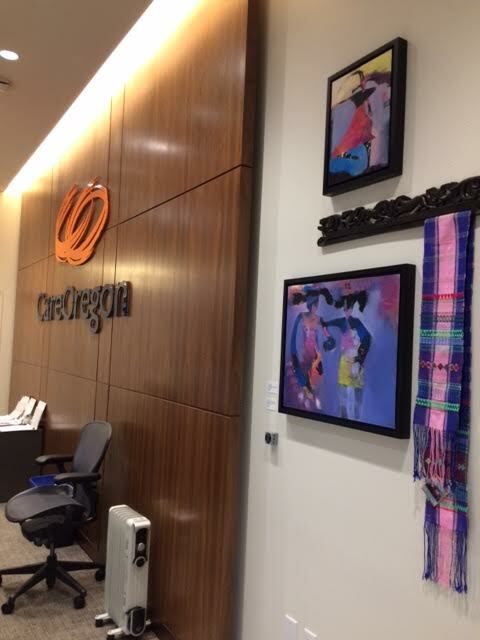 Monthly "Color of Portland Art Exhibit"
Currently, I create monthly art exhibit in the lobby for Care Oregon by rotating art work from various group of artists from diverse background to showcase the organization's commitment to their inclusive policy.